Xinjiang Tianshan, comprising four components - Tomur, Kalajun-Kuerdening, Bayinbukuke and Bogda, is part of the Tianshan Mountain system of Central Asia, one of the largest mountain ranges in the world. Xinjiang Tianshan presents unique physical geographic features and scenically beautiful areas, including spectacular snow and snowy mountains with glacier-capped peaks, undisturbed forests and meadows, clear rivers and lakes and red bed canyons. These landscapes contrast with the vast adjacent desert landscapes, creating a striking visual contrast between hot and cold environments, dry and wet, desolate and luxuriant. The landforms and ecosystems of the site have been preserved since the Pliocene epoch and present an outstanding example of ongoing biological and ecological evolutionary processes. The site also extends into the Taklimakan Desert, one of the world's largest and highest deserts, known for its large dune forms and great dust storms. Xinjiang Tianshan is moreover an important habitat for endemic and relic flora species, some rare and endangered. In 2013, Xinjiang Tianshan was added to the World Natural Heritage List. The Tianshan is a large mountain range in Central Asia stretching about 2,500 kilometers. It is the largest mountain chain in the world's temperate arid region, and the largest isolated east-west mountain range globally. The Xinjiang portion of the Tianshan runs east-west for 1,760km and is a mountain range of outstanding natural beauty. The Xinjiang Tianshan is anchored in the west by the highest peak in the Tianshan, Tomur Peak at 7,443 meters, and in the east by Bogda Peak at 5,445 meters. The range lies between two Central Asian deserts, Junggar Desert in the north and the Tarim Desert in the south. The beauty of the Xinjiang Tianshan lies not only in its spectacular snow-capped mountains and glacier-capped peaks, beautiful forests and meadows, clear rivers and lakes and red bed canyons, but also in the combination and contrast between the mountain elements and the vast deserts. The stark difference of bare rocks on its south slope and luxuriant forest and meadow on the north creates a striking visual contrast of environments that are hot and cold, dry and wet, desolate and luxuriant - and of exceptional beauty. Xinjiang Tianshan is an outstanding example of ongoing biological and ecological evolutionary process in a temperate arid zone. The landforms and ecosystems have been preserved since the Pliocene epoch because of the Tianshan's position between two deserts and its Central Asian arid continental climate, which is unique among the world's mountain ecosystems. Xinjiang Tianshan has all the typical mountain altitudinal zones of a temperate arid zone, reflecting the moisture and heat variations at different altitudes, gradients and slopes. The property is an outstanding example for the study of biological community succession in mountain ecosystems in an arid zone undergoing global climate change. Xinjiang Tianshan is also an outstanding representative of biological and ecological evolution in the Pamir-Tianshan Highlands. 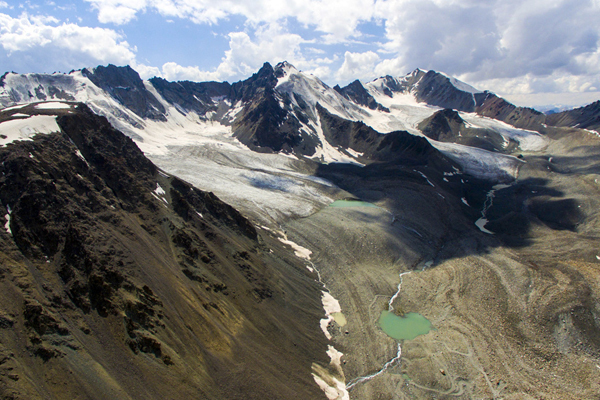 Altitudinal vegetation distributions, significant differences between north and south slopes, and the diversity of flora all illustrate the biological and ecological evolution of the Pamir-Tianshan Highlands. The property is also an important habitat for relic species and numerous rare and endangered species, as well as endemic species. It is representative of the process whereby the original warm and wet flora has gradually been replaced by modern xeric Mediterranean flora. Tianshan Pai is a northern style of kung fu that stresses rhythm, the demonstration of power accentuated by solid thuds made by the hands, the emitting of power from the entire body and the coordination of the hands and feet, as well as blocks and strikes, high kicks and low sweeps. It also features locking and throwing techniques and at the same time it contains graceful empty-hand and weapons forms. Tianshan Pai self-defense is characterized by angular attacks coupled with multiple blocks. If one block fails, the second can cover. Footwork is considered essential to countering attacks. Tianshan Pai focuses on low and steady steps to the side, along with swift "hidden" steps to trick the opponent. Paired boxing forms and exercises are emphasized for timing and accurate evaluation of distance in reference to a moving, responsive adversary. According to the legend taught by Master Wang to his students, the style originated in the Tianshan Mountains. Master Wang maintained that Tianshan Pai was an ancient style of more than 60 generations.